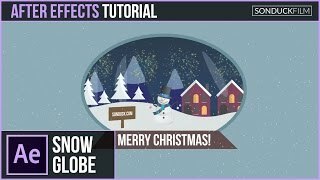 In a continuing series for christmas and winter town motion graphics, in this After Effects tutorial we will create a 2D snow globe animation. Setting up a scene like this requires a bit of thinking. To create a 2d snow globe, we start off with our christmas motion graphics from the previous tutorial. Then we seperate all of the our elements into 3D space and design the snow globe. Once those task are done, we have ourselves a pretty cool animation in AE! I love your channel, you deserve more fame. yo Josh are you currently a freelancer or working for a firm at the moment? for real bro, you don’t have enough subscribers. Your content and teaching style are better than a lot of people out there. Thank you for your dedication. Hi! I am a college student and have been working on creating this snowglobe. When I get to the opacity party so that the picture is in full color, mine does not go to full color even though the content says that it is at full opacity. I have redone this several times now seeing if I had missed a step and I can’t figure out what is happening. Do you by chance have a suggestion?